Lectures are held at Avenue House (now Stephens House), East End Road, Finchley N3 3QE, at 8pm. Tea/coffee and biscuits afterwards. Non-members welcome (£1.00). Buses 82, 125, 143, 326 & 460 pass close by. Finchley Central Station (Northern line) is a short walk away. Monday 8th to Friday 12th June: HADAS dig at Cromer Road School, New Barnet. We have permission to dig on the green space in front of the school. We know that there was a building there, which is shown on the 1967 Ordnance Survey map. LECTURE “The Roman Pottery manufacturing site in Highgate Wood” by HADAS President: Harvey Sheldon. This should be a very interesting lecture on an important local site. So do come along. Tuesday 15th to Saturday 19th September: HADAS trip to the New Forest. Based at Lyndhurst and including visits to Salisbury, Old Sarum, Winchester, Beaulieu and Bucklers Hard, and Croft pre-Victorian pumping station on the Kennet and Avon Canal. It may not be too late to join, if hotel rooms are still available. Contact Jim Nelhams (details on back page). Lecture by Dr Caroline Cartwright of the British Museum. Dr Cartwright’s primary areas of scientific expertise cover identification and interpretation of organics - wood, charcoal, fibres/other plant remains, shell, ivory and bone - from all areas and time periods in the museum’s collection. Our last Newsletter mentioned the Finchley Society AGM on June 25th, to be followed by “a dip into the archives”. Due to “technical reasons” the dip will be not take place. It will be replaced by a bit of a quiz on 'What do you know about Finchley' . Try your hand?! Desperately needed: Another once-a-year Newsletter Editor. This Newsletter is edited each month by a different HADAS member. We had a rota of 12, but one has had to resign due to pressure of work and now we have the sad news of the death of Patrick McSharry, who had been ill for some time (the next Newsletter will have an appreciation).. The Editor does not have to write the Newsletter - though that can be done too - just put together the items sent in by others, typing them out if hand written, arranging the font etc, as they please. If you’re only thinking about it, but are not quite sure, speak to any of the existing editors. Please do offer, even on a trial basis – e-mail mary.rawitzer@talktalk.net or phone 020 8340 7434. This event was held to recreate the events of seventy years ago when up to 10,000 people of Finchley and the surrounding areas celebrated the end of WWII in the grounds of Avenue House. There were lots of stalls selling a variety of items for both adults and children. There was a wonderful Sunday roast in the house as well as all sorts of goodies in the stable café. The entertainment was provided by the English Jazz Orchestra and The Three Belles. The gardens looked at their magnificent best. Sunday 10th was a lovely calm day and many people, some in appropriate costume, turned up for this event. HADAS had a stall featuring photographs and stories of many of our past excavations but majoring on when Avenue House (now Stephens House & Gardens) was used as the RAF Central Hospital from 1919 to 1925. 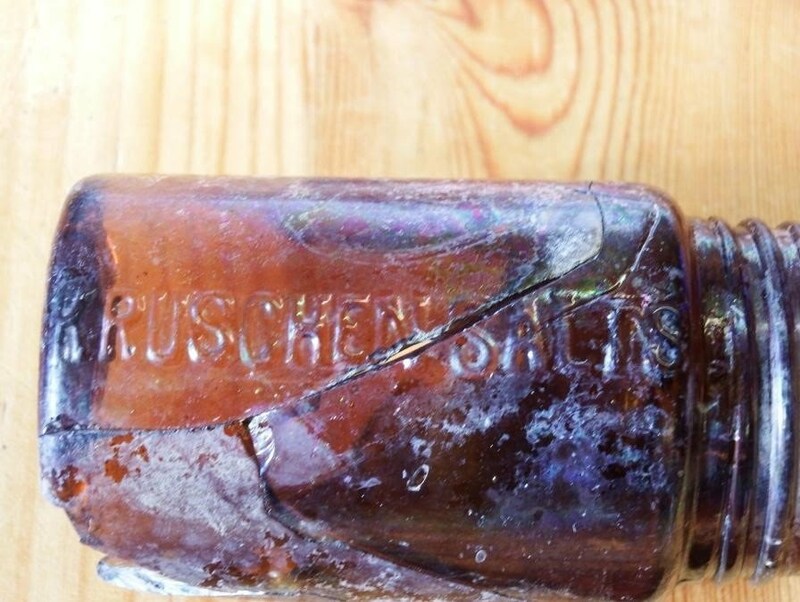 During last year’s excavation at Stephens House & Garden on what is believed to be the remains of hothouses and a laundry, we came across a dump of materials consisting in the main of glass medicine and alcoholic drinks bottles and jars (see Vicki Baldwin’s report in this issue). Was this from the time of the hospital? Our display created great interest and it was great to see so many HADAS members, including William Morris, attending the event. He joined HADAS in 1969 and is still a member. He designed the HADAS logo – the handled jug in the form of ‘HADAS’, as seen on the front heading. William remembered digging in the earlier days with Bridget GraftonGreen, Ted Sammes and Dorothy Newbury. Copies of our new book “A Hamlet in Hendon” as well as other publications were sold and new members joined. All-in-all a great day out. Thanks to everybody who helped. Glass was present in all three trenches opened and, sparingly, throughout the fill. However, Trench 3/Context 3 revealed a small glass deposit containing complete bottles and sherds moulded with proprietary brand names and identifiers. One complete vessel also retained a fragmentary label on its surface. As yet this has not been identified. with an additional “?” category for the few sherds of indeterminate function. 1) Domestic: drinking glasses; bowls; vases; ornaments etc. 3) Medicinal: bottles, jars and equipment with an obvious medical/therapeutic function. 4) Comestibles: containers for foodstuffs – jars, bottles etc. The full table of the Avenue House glass finds should be on the HADAS website soon. It shows the distribution of these various types over the 3 trenches. Since the greatest number of sherds and types occurs in Trench 3 Context 003 I shall concentrate on this particular deposit. It appeared to have been discarded as a group and not added to over time. The deposit was lying against the inner face of a vertically truncated wall which formed part of the building(s) being excavated. The actual function of the building(s) is yet to be determined but may have comprised a laundry and/or glasshouse complex. Deposition must have occurred shortly after the demolition of the building(s) as the glass was lying directly on a ‘floor’ surface and subsequently covered by backfill. 1) Domestic: 27 sherds in total. 6 co-joining may be the chimney from a gas mantle or oil lamp. 12 have a fine gilded decoration and are of a thickness suggesting a wine glass or similar. 2) Architectural: 41 sherds in total. 36 window glass type 3mm thick. 5 fanlight/skylight/glass roof type 6-7mm thick. 3) Medicinal: 15 sherds + 4 complete bottles. 1 complete green glass bottle with fragmentary label adhering. 1 complete green glass bottle unmarked. 1 complete white glass bottle moulded with calibrations and “TABLESPOONS” on the sides and “UGB CODE” on the base. 1 complete white glass bottle moulded with “113” and “6” on the base. 7 co-joining sherds brown glass moulded with “Kruschen Salts” on the side. 6 co-joining sherds white glass moulded with “Lung Tonic”, “... bridges” and “... ons” on the sides, probably “Owbridges Lung Tonic” (Owbridges of Hull). 2 co-joining sherds white glass moulded with “..H. Galloway Ltd/Chemist/London SE17”. 4) Comestibles: 87 sherds + 4 complete bottles. 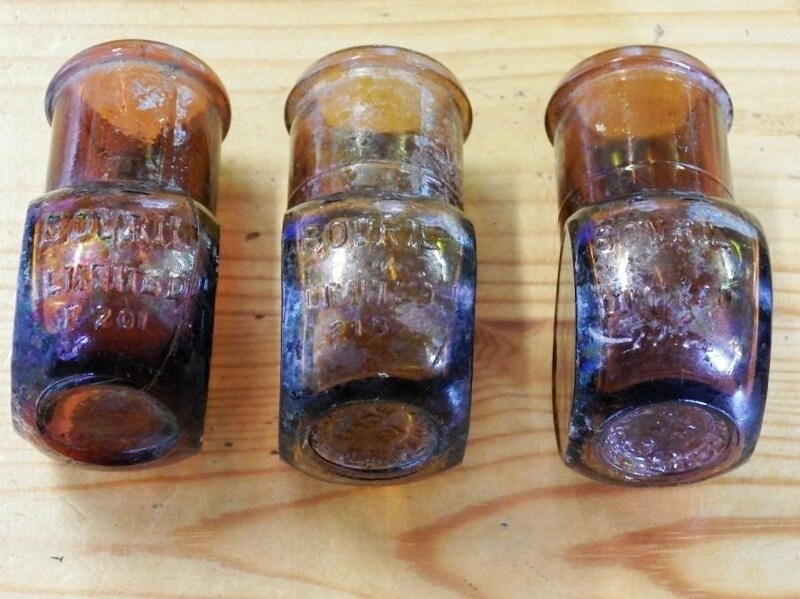 3 complete “Bovril” bottles, 2oz size, moulding on shoulder “Bovril Limited” and code number, and on base of 2 “BOTTLE MADE IN ENGLAND”. 1 complete white glass bottle moulded “HENEKEY’S LTD”. 9 sherds white glass moulded with “WALKER’S S KILMARNOCK WHISKY” on the base. 1 incomplete white glass bottle moulded “BOOTH’S DISTILLERY LONDON LTD” on the side and “Registered No. 422820” on base. 3 co-joining sherds white glass milk bottle moulded “... of Express Dairy Company Limited “, “Please rinse and return” on side and “X29” on base. 2 co-joining sherds moulded “United Dairies Ltd”. 1 sherd white glass jar base moulded “A3” “S13” “B”. 52 sherds white glass possibly from bottles. 3 white glass bottle necks. 2 white glass bases. 1 white glass jar top with ribbing. 1 white glass jar neck 8cm diameter. 1 sherd identified as milk bottle. It is difficult to be certain exactly when the glass was deposited. There are some clues as to the age of some of the bottles and jars. Bovril jars/bottles with long necks date to before the 1930s. Bovril itself was widely sold by 1888 and the company formed in 1889. It was often used as a beef tea for invalids. 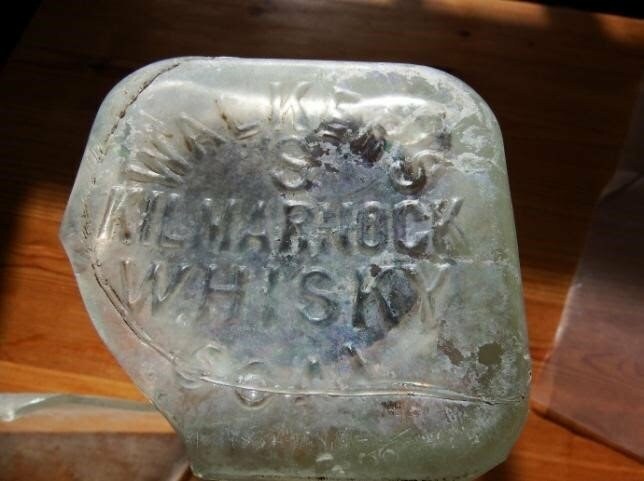 Walker’s whisky bottles had a large letter X on the base between the words “Walker’s” and “Kilmarnock”. This changed in 1910 to an S and the example in this assemblage has an S. The Galloway’s medicine bottle sherds have an embossed post code of SE17. London post codes with numbers rather than just letters were introduced in 1917. This is a very interesting collection of glass. It is unclear whether it was all discarded at the same time but it would seem likely to be the case. Possibly it is related to the period when Avenue House was an RAF hospital. It may be material cleared from the house before use as the hospital, or even after. I doubt whether it would be any earlier. Galloway’s, along with whatever the other medicine bottles contained, dispensed to patients at the RAF hospital? Why was the glass there? Should it have been disposed of elsewhere? Was it separated from other rubbish because it could not be composted or incinerated? And other online sources for: post codes, Owbridges, Galloway’s, Walker’s, and other proprietary brands. The lecture focused on the origins of the Knights Templar and properties and places associated with them in London during the period of their success and subsequent downfall. The Knights Templar were a military order that followed a religious life. In 1119, in response to the problems encountered by pilgrims travelling between the coast and Jerusalem, Hughes de Payers approached King Baldwin II of Jerusalem for permission to provide protection in the form of a military order. This was granted and the nascent order was given a headquarters at what is now the Al-Aqsa Mosque on Temple Mount. Known as the “Poor Fellow Soldiers of Jesus Christ and the Temple of Solomon” subsequently shortened to Knights Templar, the knights’ vow of poverty was portrayed on their seal by an image of two knights sharing a horse. Order both their Rule and their white mantle as a symbol of purity. With such endorsements, the Knights Templar swiftly became a popular charity receiving gifts of land and money. Although they practised poverty, as an Order they became extremely wealthy with branches in most of the European countries involved in the Crusades. Travellers not wishing to carry large quantities of valuables were able to lodge them with one Templar foundation and receive a paper entitling them to draw the value from another. These papers may have been the first cheques to be issued. The financial success of the Order helped lead to their downfall. In England, the Templar had holdings in all counties. Originally their London base was at the west end of Chancery Lane, but they moved to larger premises at Holborn Gate – outside the city wall – where there was access to the river. The Templars sent two fleets a year to the Holy Land to replenish forces and stores. After the fall of Acre in 1291, the Templars withdrew to Europe, and their huge resources began to attract attention. Philip IV of France had borrowed from the Templars, and in 1306 the new Pope Clement V, based in Avignon, invited the Grand Masters of both the Templars and the Hospitallers to discuss amalgamation. The Hospitaller Grand Master was delayed so Jacques de Molay attended alone, arriving in 1307. Subsequently charges were brought against the Templars relating to accusations made two years earlier by a dismissed Templar. On 11th October all Templars in France were arrested and accused of blasphemous practices including worshipping a head. Edward II came under pressure to close down the order. He did not want to act, but under threat of excommunication he arrested the English Templars in 1308. They were sent to Canterbury and then the Tower of London. Interrogations took place at several churches in London including St. Dunstan’s in the West and All Hallows by the Tower. Philip IV had tortured and burned the French Templars. Edward II allowed the Templars to be tortured by French monks as long as they were not permanently injured. Eventually the English Templars agreed to be “reconciled”, admitting their property forfeit. In other countries, Templars were assimilated into other Orders. In London Temple property was leased to lawyers with Middle Temple and Inner Temple still legal Inns of Court. I went to the Annual General Meeting of the London Archaeologist on 14th May. It was followed by a stimulating lecture by Dr Dominic Perring. Basing himself on what had come out of the 250 or so archaeological interventions relevant to Roman London over the past 25 years he argued that the archaeological and historical evidence was much more consistent and mutually supportive than it has been fashionable to believe. The episodes of change detected in the archaeology can be ascribed to Roman imperial policy; 'Londinium Augusta' was closer to Rome than to the rest of the province; it had a military, not civil, origin and was populated by people from Rome and their hangers-on; it was the location of power, not a civic centre; Dr Perring expressed sympathy for Andrew Selkirk's contention that there was direct imperial control. According to Dr Perring there had been a Claudian fort, surrounded by a double ditch, but leaving only faint traces because the soldiers were in tents not permanent buildings, awaiting the arrival of the emperor and his elephants before moving to capture Colchester. He went on to relate the numerous box flue tiles from AD50-60 to bath-houses for official residences. Imperial control was re-imposed after the Boudiccan insurrection. The Flavians looked back to the successes of Claudius and Caesar before him and, for instance, constructed the original timber amphitheatre. Hadrian in 121AD decided to build the massive Forum, raising the money from the rest of the province. The major fire of about 128AD was not accidental, but the result of an uprising, one consequence of which was the construction of the Cripplegate fort. The many heads found near the Walbrook could be trophy heads - similar to those depicted on Trajan's column. Finally, Dr Perring related the contraction in the latter half of the second century to the historically recorded plague in around 165AD; this contraction, he observed, was accompanied by temple-building (with statues of hunter-gods). I said 'finally' in the last sentence because Dr Perring then ran out of time, with intriguing references to the exploits of Allectus, which he held over to another occasion. Sat. 13th & Sun 14th June. London Open Garden Squares Weekend. More than 200 gardens, many not usually open to the public. See: www.opensquares.org.uk. Including 1-5pm, Bothy Garden, Avenue House, East End Rd N3 3QE. Thursday 18th June, 7.30pm. Camden History Society, Camden Local Studies & Archives Centre, 2nd Floor, Holborn Library, 32-35 Theobalds Rd, WC1X 8PA. AGM (7pm) then talk: Archaeology of Kings Cross Goods Yard by Becky Haslam. Visitors £1. Light refreshments 6.30pm. Sunday 28th June. Barnet Museum & Local History Society: Tea in the Park. In park behind Museum, Wood St, Barnet. An extra special event to mark The Barnet Battlefield Survey. Archaeologists giving up-date on progress of the project and re-enactors showing some weaponry used in 1471. Also musical events and fine teas! Wednesday 1st July-Wednesday 30th September. Avenue House, Exhibition: Avenue House at War. Experience a flavour of wartime Avenue House & discover how it gave service to the nation on the home front in two World Wars as a hospital (WWI) & ARP HQ (WWII). Free admission. Friday 3rd July, 7.45pm. Enfield Archaeology Soc., Jubilee Hall, 2 Parsonage Lane, Enfield EN2 0AJ. Enfield at War: Shirts, Shells & Poison Gas. Lecture Ian Jones, Visitors £1. Refreshments. Saturday 4th July, 11am-5pm. Friends of Kensal Green Cemetery: Open Day. Dissenters’ Chapel & Gallery, 391 Ladbroke Grove W10 5AA/Harrow Rd W10 4RA. 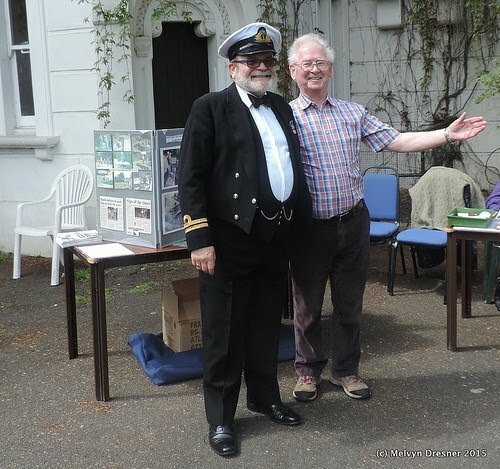 Tours, displays, refreshments, stalls, incl. Willesden Local History Society. Sunday 5th July, 2.30pm. Heath & Hampstead Society. Meet outside Parliament Hill Cafe, nr the Lido off Gordon Rd, Gospel Oak NW5). Treasures of the Heath: Clues to the Landscape and its History. Walk led by Deborah Wolton, approx. 2 hrs. Donation £3. Sat. 11th-Sun. 26th July. Festival of Archaeology at Museum of London, EC2Y 5HN. Tours & events. See www.museumoflondon.org.uk & www.archaeologyfestival.org.uk. Tel 020 7001 9844. Sat. 11th & Sun. 12th July. Enfield Archaeological Society. Dig at Theobalds Palace, Cheshunt. Contact Mike Dewbrey on 01707 873756 or see www.enfarchsoc.org. Tuesday 14th-Sunday19th July. Enfield Archaeological Society. Dig at Elsyng Palace, Forty Hall, Enfield. Details as above. Saturday 15th July, 9am. Barnet Museum & Local History Society. Coach outing to Greenwich. Tel 01707 858430 or 020 8440 8066 for more info. All welcome. Cost £15. Saturday 18th July. Festival of Archaeology. COLAS at the Museum of London. Object handling, activities, games, etc. Saturday 18th July, 9.30-11.30am & Sunday 19th July, 10am-12noon. Festival of Archaeology, Thames Discovery Programme at Tower Beach. Beachcombing on the foreshore, opp. The Tower. Sunday 19th July, 12-5pm. Avenue House (Stephen’s House & Gardens) Summer Garden Party. Lots of stalls, incl. HADAS, live music, food at House & Cafe. Free admission. Friday 24th July, 7pm. COLAS: The City Bridges Annual Walk. Meet at church of All Hallows by the Tower. Led by Peter Smith. £4.